360 cameras are fast becoming the hot new accessory to have for your iPhone. At one time these unique cameras were big, bulky and expensive – now they are small enough to clip into your iPhone and often cost less than you might think. 360 cameras allow you to take panoramic photos and videos that show the entire environment in 360°. With the rise in popularity of VR and with Facebook and YouTube pushing their 360 services hard, now is the time to invest in a 360 camera for your iPhone and start taking immersive, 360 photos and videos. This table shows the detailed specifications of every 360 camera compatible with iPhone’s. If these numbers make no sense to you don’t worry, scroll down for a more detailed analysis and for my recommendation. The Rylo is without doubt the best 360 camera for iPhone’s in terms of image quality and software. This 4K 360 camera shoots excellent quality video and pretty decent photos too. What makes it great is the amazing software that allows you to manipulate and edit your 360 video. The re-framing feature means you never have to move or point yuor camera again, just choose what you want to focus on when editing. 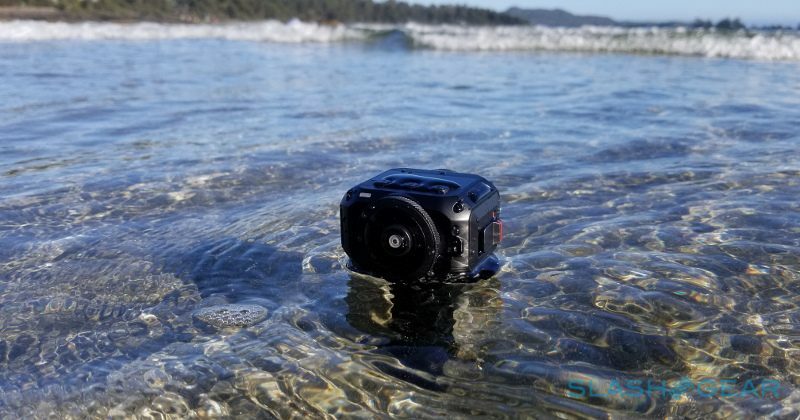 The stabilization on this camera is also the best I’ve ever seen, so even if you are running, cycling or skydiving you’ll still have perfectly smooth video. The down sides to this camera include not being able to live preview your images and having to transfer files via a cable rather than wirelessly. Read my full Rylo review here. Released early 2018, this is the second generation Insta360 Nano and comes with some features not found in any other camera on this list. The Nano S can shoot 360 video in 4K and shoot 20mp photos. It attached directly to your phone making it very easy to pick up and shoot. The main features of this camera include 360 video chat, allowing you to share your 360 video with anyone. You can also shootwhat is known as multi view videos, which splits your screen into several segments, each filled with a different view of your choosing. 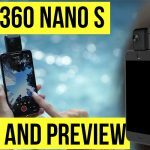 The Nano S is great for using it’s 360 capabilities to create interesting content never really seen before. The video quality of this camera doesn’t seem to be as good as some other 4K cameras however, and the battery power is pretty low at just 60 minutes of usage. This is probably the best value 360 camera for iPhone’s considering the number of features you get. This tiny device plugs right into your iPhone and turns it into a 360 camera. It’s portable, pocket-able and still pretty powerful. 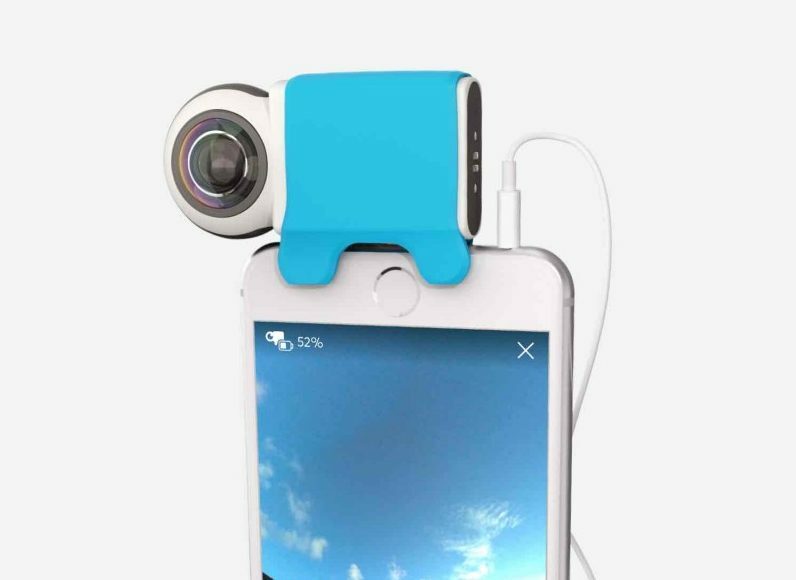 The Giroptic iO is designed to plug into the thunderbolt port of your iPhone or iPad where you can then use it to take 360 photos and videos. You control the camera with Giroptic App (free) which you’ll need to download off the app store. Once you plug in the camera the app will automatically open and you’ll be able to start shooting. You’ll need to hold your camera upside down to use it properly which takes a bit of getting used to, but after a few minutes you’ll barely notice. The Giroptic iO is particularly good at taking 360 photos, with an exceptionally high resolution sensor for its size (almost 4K). Video is on the lower side, but is passable f you just want to share clips on Facebook. The iO is also Facebook Live ready, which means it can livestream to Facebook in 360° quickly and easily. This is one of the easiest to use 360 cameras out there and it’s specifically designed for best use with apple devices. I’d fully recommend the Giroptic iO as a 360 camera for your iPhone, particularly if you are more interested in photo that video. The Insta360 Nano is another 360 camera accessory that plugs into the thunderbolt port. It’s another tiny, inexpensive device that turns your iPhone into a 360 camera, just download the Insta360 App to control the camera and share on social media. The Insta360 Nano can’t shoot photos quite as well as the Giroptic, but it can shoot much better video. 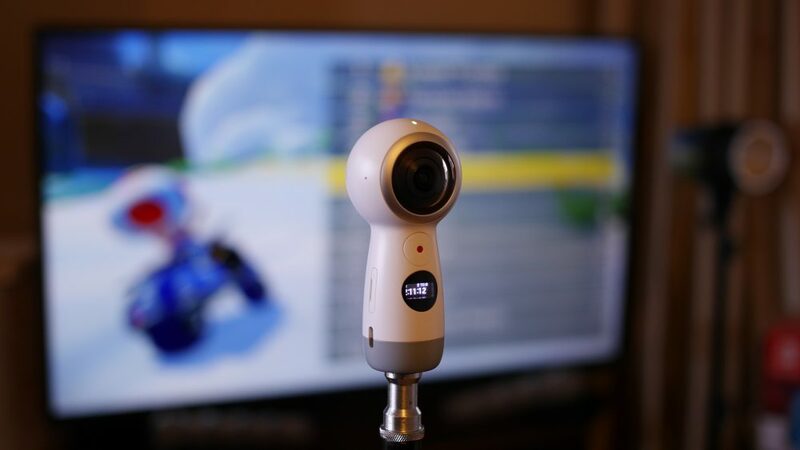 In fact the Insta360 nano is one of the best casual 360 camera for video because it also features stabilization software that will keep your 360 video looking smooth. 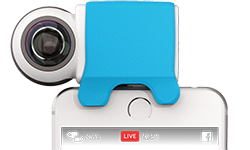 The Insta360 Nano is Live Stream Ready and live streams can be set up in just a few seconds from the app. This is the older model of the Nano range, so lacks some of the more modern features of the newer version, but it’s also significantly cheaper! 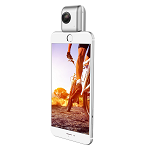 The Nano has been one of the most popular 360 cameras ever, and for good reason. It’s well built, the software is easy to use and its super portable. I’d recommend the Insta360 Nano as a 360 camera attachment for your iPhone, especially if you are looking for a cheaper option. Unlike the previous two cameras we’ve looked at, the Gear 360 is a stand alone camera. This means that it doesn’t physically attach itself to your phone and is a bit more bulky, however this camera is also a lot more powerful. Designed and built by Samsung, this is a rare occasion where a major tech company allows their device to be compatible with a rivals, well, almost. 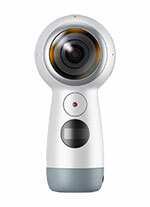 The Samsung Gear 360 connects wirelessly to your iPhone via the Gear 360 app which is available on the App Store. You can control the camera and share videos and photos using this app, however the livestream function does not work on iPhone’s. The Gear 360 can shoot 4K 360 video, which is considered the gold standard for 360 cameras. It can also shoot 360 stills, but at a lower resolution. The camera is designed to be handheld, but it can also attach to a selfie stick or tripod. I personally use this camera, albeit with a Samsung phone, and I’m very impressed with the video it can produce, especially for such a low price. You can read my review here. The newly released Garmin VIRB 360 is one of the most powerful 360 cameras ever; it can shoot up to 5.7K 360 video, is waterproof, shock proof and can livestream in 4K. All of this doesn’t come cheap, but the VIRB 360 is definitely the 360 camera to beat this year. Fully compatible with iPhone’s, the VIRB 360 connects to your phone wirelessly. You can set up a 4K live stream from the app as well as control the camera and share media. The Garmin can survive where most other cameras would be doomed, for example you can take it swimming in up to 10m of water or attach it to your helmet for a bike ride. The most powerful 360 camera out now. Perfect as an action camera and can live stream in 4K.